Medieval: Townfolk I| RPG Maker | Create Your Own Game! As you take your first steps into this new town, you are met by a beggar woman pleading for alms. Just up the street you see a comely lass sweeping the cobblestones and from somewhere nearby the hammering of metal on metal from the Blacksmith’s shop. 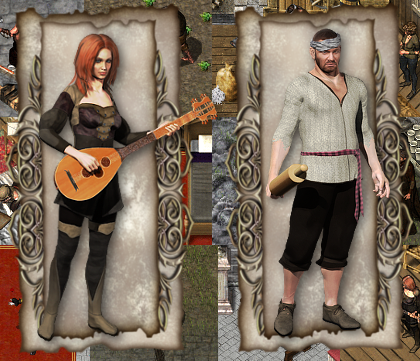 No town is complete without an assortment of characters to inhabit it. This add-on pack includes characters that each have completely unique looping animations to give your towns atmosphere and make your maps livelier. 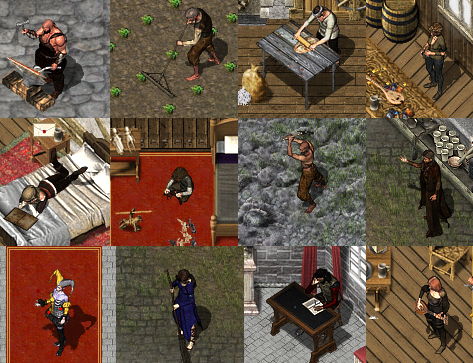 There is a Blacksmith, a Bard, a Barkeep, a Beggar, a Jester, a Merchant, a Street Sweeper, a Baker, a Farmer, a Miner, a Scribe, a Mysterious Skulker, and two children, all of which have unique animations in addition to over 50 other animation spritesheets for walking, running, sitting, sleeping, kneeling, and much more. 14 Unique characters, each with unique animation pertaining to their profession. A total of 786 individual resources including all spritesheets, facesets, busts, and paperdolls. Material matches other DLC in the Medieval series. Click here to see animated GIF samples.